I am very excited by the prospect of Pluto regaining his status over New Mexico. The same should apply should he pass over the Magic Kingdom, such as in Astro Orbitor as pictured above. Egnor would also be great as an HMO patient. No need to use those expensive new antibiotics under any circumstance. As antibiotic resistance cannot occur, I could always stick with the older, cheaper antibiotcs. The Panda’s Thumb responds by noting that it is often possible for doctors to practice state of the art medicine without any understanding of the basic science if they follow established standards of care. While this could be done it is hardly desirable to promote such ignorance as desirable. Egnor is incorrect in his claims that evolution isn’t studied in medical school. Many examples of the teaching of evolution in medical school are provided. In addition, evolution is a basic science which pre-med students are expected to have studied before applying, and is a part of the Medical College Admission Test which must be taken before applying to medical school. Panda’s Thumb also refutes Egnor with examples of professors at medical schools who have interests in evolution as well as noble prize winners in medicine for advances based upon evolutionary science. More at Pharyngula, Northstate Science, ERV, and Afarensis, with background information at the Evolution and Medicine Network. His career since then has indeed resembled a certain famous Jedi. He began as a crusader for justice. Soon he realized that he needed to acquire more power in order to accomplish his noble goals. But over time, his pursuit of power became the goal itself, and by the end he lost his capacity to differentiate between right and wrong. This is not Luke Skywalker here. This is Luke Skywalker’s father. But at least Darth Vader attained his position before the Death Star exploded. SOME 2,500 years ago, one of Confucius’s big ideas was the “rectification of names”. If only, he argued, sons would behave filially, fathers paternally, kings royally and subjects loyally, all would be well with the world. A faint echo of this thesis has been resounding this week in the cavernous auditorium of Beijing’s Great Hall of the People, where nearly 3,000 delegates to China’s parliament, the National People’s Congress (NPC), have been enjoying their annual fortnight of wining, dining, snoozing and pressing the “yes” button. Living up to one’s name poses something of a problem for the Chinese Communist Party, which dictates the laws the NPC will pass, and whose name in Chinese literally means “the public-property party”. To such a party it must be an ideological embarrassment that China has such a large and flourishing private sector, accounting for some two-thirds of GDP. 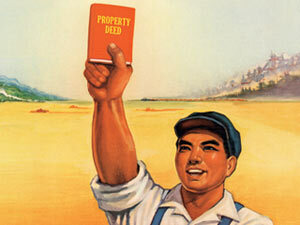 So one law due to receive the NPC‘s rubber stamp this month, giving individuals the same legal protection for their property as the state, has proved unusually contentious. It was to be passed a year ago, but was delayed after howls of protest from leftists, who see it as among the final of many sell-outs of the ideas of Marx, Lenin and Mao Zedong, to which the party pretends fealty. The party’s decision to enact the law in spite of that resistance is a great symbolic victory for economic reform and the rule of law. Clearer, enforceable property rights are essential if China’s fantastic 30-year boom is to continue and if the tensions it has generated are to be managed without widespread violence. Every month sees thousands of protests across China by poor farmers outraged at the expropriation of their land for piffling or no compensation. As in previous years, placating those left behind in China’s rush for growth has been a main theme of the NPC (see article). Ted Sorensen, the speechwriter and special counsel to President John F. Kennedy endorsed Senator Barack Obama tonight and compared Obama’s campaign to Kennedy’s run almost half a century earlier. Sorenson also sharply rebuked legislators who voted to authorize the Iraq war, a group that includes Senator Hillary Clinton and former Senator John Edwards. The first serious problem is structural and political: A man who fought the inherent limits of his mayoral office as fanatically as Giuliani would construe presidential prerogatives so broadly he’d make George Bush’s notions of ‘unitary’ executive power seem soft. Even in the 1980s, as an assistant attorney general in the Reagan Justice Department and U.S. Attorney in New York, Giuliani was imperious and overreaching, He made the troubled daughter of a state judge, Hortense Gabel, testify against her mother and former Miss America Bess Meyerson in a failed prosecution charging, among other things, that Meyerson had hired the judge’s daughter to bribe help ‘expedite’ a messy divorce case. The jury was so put off by Giuliani’s tactics that it acquitted all concerned, as the Washington Post’s Ruth Marcus recalled ten years later in assessing Special Prosecutor Kenneth Starr’s subpoena of Monica Lewinsky’s mother to testify against her daughter. There are many reasons to like Giuliani, but his personal intolerance of any hint of disloyalty, his contempt for dissent, his corner-cutting executive excesses and long history of cronyism must and surely will be weighed in the equation. Jim Sleeper is no lefty. His concerns are serious ones in a period when the constitution has already been strained to near-breaking point. Will Liberals Really Take Away Your Guns? In response to my previous posts arguing that at present liberals are far closer to libertarians than conservatives, some Republican-leaning libertarians have cited out dated ideas as to the views of liberals on the right to own guns. Some echo conservatives in arguing that liberals will take away their guns (but at least don’t repeat the conservative claims that liberals will also take away their bibles). We see evidence of the lack of such a desire among liberals in the reaction to the federal appeals court’s ruling on Second Amendment rights in Washington, D.C. While some courts have argued that the ambiguously-worded amendment only pertains to a right to maintain a militia, this ruling interprets the amendment as giving the right to own guns to individuals. I would assume that ultimately the Supreme Court will decide upon this issue. Personally, I can’t imagine a city law banning all guns in private homes. It’s absurd. I believe it is also unconstitutional. As for my gun expert husband, he simply wouldn’t live where guns were banned by law. No American should be forced to; not with the Second Amendment as law. It’s not over by a long shot, but I hope that the ruling stands and that D.C. residents get the right that all Americans deserve under the Second Amendment of the Constitution. Keep fighting. Guns are not for everyone. If you don’t like them, don’t own one. Of course they need to be regulated, with background checks for owners mandatory. But they should definitely not be banned. Looks like they got it right, folks. It IS a “right”, and perhaps, even a responsibility to protect oneself and one’s loved ones via the “great equalizer” as well as one of our few civil liberties we have somewhat left to us. On top of it all, with the far-right’s attempts to install a theocracy all around us, we just MIGHT want to think about that little “tyranny” comment by Judge Silberman for a moment. While “tyranny” is not exclusive to the right, there is little doubt that the tyrants of the far-right are armed to the “T’s” compared to the tyrants on the far-left. Good news for those who, like me, believe the Second Amendment confers an individual right to bear arms. The D.C. Circuit Court of Appeals today holds it does. Despite his history, Obama is cast by the press as the candidate unwilling to stoop low enough to win, while Hillary is the machine politician whose last name has become synonymous with ruthlessness. But that David-versus-Goliath framing of the race is overstated. Obama’s political team is seasoned and conventional. His media adviser and strategic guru, David Axelrod, has spent decades in Chicago politics working for both the reformers (Harold Washington) and the machine (Richard M. Daley). Obama has all of the political machinery–ad-makers, fund-raisers, opposition-researchers–in place to run a serious but traditional campaign. Moreover, when Obama’s ideals clash with reality, he has been able to find compromises that don’t put him at a political disadvantage. For instance, no Democrat can win the general election while adhering to the public financing system if the Republican nominee doesn’t do the same. Clinton and John Edwards have simply conceded that the public financing system is dead and are ignoring fund-raising restrictions that would be triggered if either ends up playing within the public financing scheme. Facing the same situation, Obama–a longtime champion of campaign finance reform in general and public financing in particular–asked the Federal Election Commission if he could raise the potentially restricted money now (the world as it is) but then give it back if he wins the nomination and convinces his Republican opponent to stick with public financing (the world as we would like it to be).